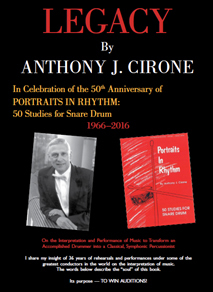 This year, 2016, we celebrate the 50th anniversary of Portraits in Rhythm – 50 Studies for Snare Drum. I wrote this book in 1963 during my fifth year of study at The Juilliard School, it was published in 1966 —and now, 50 years later, it has become the global standard for training classical percussionists at top music schools around the world. In the early 1960s, snare drum books consisted primarily of basic rhythms and simple instructions. While the musical elements of descriptive tempo markings, contemporary time signatures, dynamics, and musical directives were commonplace across most instrumental music, composers had not yet begun using them for solo Snare Drum literature. Portraits in Rhythm – 50 Studies for Snare Drum was one of the first books to incorporate mixed meters, musical directives, and classical musical forms within snare drum solos. My new book Legacy was written to add another level of technical skill by repetition of demanding exercises, and musicianship by interpretation of the composer’s musical instructions. The integration into this book of what I learned about technique and musicality in the last fifty years as a symphonic percussionist, university professor, and private instructor, will help transform the technically accomplished drummer into an artistic and expressive classical symphonic percussionist. The sub-title this book is: “On the Interpretation and Performance of Music to Transform an Accomplished Drummer into a Classical, Symphonic Percussionist.” Here I share my insight of 36 years of rehearsals and performances under some of the greatest conductors in the world on the interpretation of music. The words in the 3rd column below describe the “soul” of this book. Its purpose — TO WIN AUDITIONS! One important observation regarding the chart below, the closer one gets to the third column, the more likely the resulting musical performance will affect the decision of judges in selecting winning candidates during auditions. The percussionist’s transformation outlined in Legacy includes excerpts from nine text books that have become instrumental in my pedagogical approach to attaining symphonic-level competence. By studying my analysis of these excerpts, a new level of technique, insight, inspiration, interpretation, musicality, and artistry can be added to the performance of music. 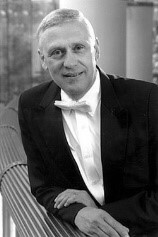 The instructions in the music, including every word, articulation, dynamic, phrase, or musical directive—provide clues to the composer’s intentions. When composers do not add many of these elements, we must use our imagination to create a masterful performance. Without developing a thorough understanding of the foreign-language terms and notations used by composers, a masterful performance is difficult to achieve. I hope my new book Legacy will increase your musical awareness in creating a captivating, compelling, and passionate performance. This e-book is reflowable in nature and will render differently at different font sizes, margin settings, and other reader preferences on various e-readers. Best results will be seen on these e-readers: Adobe Digital Editions, iBooks, Readium.